Sweet potatoes are ranked as one of the healthiest foods you can eat. I'm not sure where brown sugar ranks on that list, but they are a perfect match. This is one of my favorite side dishes in the winter, and truth be told, I make it for Thanksgiving, Christmas and several dinners in between. Enjoy! 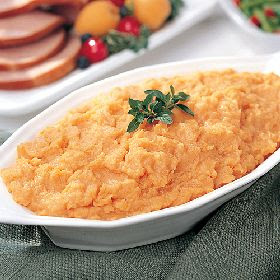 Whipped Sweet Potatoes with Brown Sugar 3 large sweet potatoes 1/4 cup brown sugar 2 tbsp. butter extra virgin olive oil salt 1. Boil large pot of water, while you peel, and chop sweet potatoes into 2"-ish cubes. 2. Once water has come to a boil, drop in potato cubes. When it is easy to pierce with a fork (without any resistance) they are ready. Remove from heat. Drain water, and return sweet potatoes to the same large pot. 3. Drop in butter, brown sugar and a drizzle of extra virgin olive oil. 4. Mix with electric hand mixer until sweet potatoes are completely whipped. 5. Salt to taste and enjoy with some steak.